Most Civil War enthusiasts immediately dismiss Pope as not worth their time. That’s a mistake. The man wasn’t the most brilliant general, but he was also not an idiot. In reading this book we find he used good judgment many times during the campaign, and Pope was responsible for elevating one of, if not the, best cavalry officers the Union would produce. “[“Stonewall”] Jackson and his two divisions arrived at Gordonsville on July 19. Their arrival, coincidentally, foiled the first of Pope’s efforts to lay waste to the Virginia Central Railroad. Pope’s plan showed, at least, that he had learned something from the Confederates regarding cavalry, for he proposed two quick dashes by cavalry forces against the Virginia Central Railroad. The first came on July 17, when Union cavalry under Brigadier General John P. Hatch moved from Culpeper, intent on destroying the railroad around Gordonsville, and then toward Charlottesville. But Hatch moved slowly, encumbered by infantry and artillery, and by the time he reached Madison Court House, still fifteen miles short of his goal, he learned that Ewell’s division was already at Gordonsville. To Pope’s disgust, Hatch declined to face the Confederates and withdrew toward Sperryville. Pope’s second forward effort met with slightly more success. On the night of July 19 the 2d New York Cavalry, commanded by rising daredevil Judson Kilpatrick, dashed south from Fredericksburg and the next day struck the Virginia Central Railroad near Beaver Dam Station. Though unpracticed in what would later in the war become an art, the regiment ripped up track, burned the depot, cut the telegraph and, as Union General King later told it, ‘created a general alarm in that part of the state.’ The New Yorkers claimed one hundred barrels of flour and forty thousand cartridges destroyed, and captured a young Confederate captain. The capture of the captain would become the most remembered of the accomplishments. His name was John Singleton Mosby, then on his way to join Jackson. He carried in his pocket a recommendation from Stuart: ‘He is bold, daring, intelligent and discreet.’ The Federals should have taken heed of Stuart’s recommendation, but instead–much to their later regret–they paroled Mosby a few days later. The damage wrought by the 2d New York, though encouraging to Pope, was trifling. The Confederates put the railroad back in full service within a day. But if the stabs at the railroad had no substantial effect on Confederate logistics, they had at least revealed to Pope Jackson’s presence at Gordonsville. That stimulated still more activity by the Union commander: a reconnaissance from Culpeper on July 21; another from Fredericksburg on July 22, and still another on July 24. Hatch again attempted to strike the Virginia Central between Gordonsville and Charlottesville but failed, he said, ‘from the utter breaking up of his horses, the state of the roads, and the storms.’ With this second failure, Pope relieved Hatch of command of Banks’s cavalry and ordered him to Fredericksburg to direct a brigade of infantry in King’s division. Despite such bungling, by July 25 there could be no doubt in Pope’s mind that Jackson, with perhaps as many as thirty thousand men, confronted him.” [pp. 24-25] Hatch’s replacement was Brigadier General John Buford. Hennessy’s descriptions of the action are clear and lucid. It’s easy to follow the troop movements from his text, and the maps give us a great view of the geography. He gives us excellent analysis of the two commanders’ decisions and why they made those decisions. He’s also strong on discussing the results of the campaign. If you want to know about the Second Bull Run, aka Manassas, Campaign, this is the book to read. It’s best read after reading Robert K. Krick’s Stonewall Jackson at Cedar Mountain, and it could use more information on the Battle of Chantilly, but this book is the best out there on this campaign and especially on the battle of Second Bull Run, aka Manassas. I highly recommend this book for students of the war. It should be on every Civil War student’s bookshelf. This is a first: A review of a book that I am actually finishing up, myself. I will admit: I did not want to read this book, but I had to in order to get the most out of a — hopefully — tour that I will be participating in. I don’t normally like campaign books, because the ones that I have read remind me of pushing around little toy soldiers on mock-up fields. If the maps are not near-Topo quality, than the whole book is for a loss, in my experience. Also, in the past, there has been a lack of a basic narrative, so without preparation, one would not really understand troop movements. Enough grousing, because Return to Bull Run has none of these issues. Thankfully, John Hennessy takes you by the hand and gently and thoroughly walks you through the battles and the campaign as a whole. Decisions are analyzed as they are made, and chapters are re-capped with a paragraph or two of overview at the end. I would go so far as to re-name the book “Campaigns for Dummies: An Introduction to Civil War Battles and Campaigns”. Thanks for the comment, Shoshana. I’m glad you also enjoyed the book. I agree with your comment. John is a fine example of the great work the National Park Service historians are doing. I remember hearing Mr Hennessy speak not too long ago (but long ago enough that I cannot recall where) about his book. 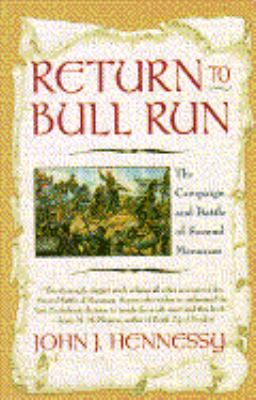 Your review failed to mention that the original publication date of “Return to Bull Run” was 1992, a year that pretty much pre-dates the internet. Anyway, Mr. Hennessy related all of the actual legwork that went into researching the book. He detailed travels to archival resources, etc. His point was that today, if he sat down to research and write the book, he could have accomplished over 90% of it from his home!! Kinda interesting to consider how things have changed. That is a very interesting torpedo of my claim. Boy, memories certainly can be fuzzy, but I am almost certain if was Mr. Hennessy who related the story that I shared. Maybe I’m way off base, I have been before! I think that I likely saw Mr. Hennessy speak in the past 6 years, so maybe his perception has changed, but certainly can’t be that dramatic. I will be looking at the article you quoted today, but wish to figure out where I got the idea of the story I shared. Any ideas? On the ideas front, in his post John states that overall (that is, not just for manuscripts), and including newspapers and so forth, he found that 63% of what he used for “Return” had been put online by the time he was writing. That moves much closer to what you recollect, so perhaps that explains the discrepancy. C-SPAN covered several talks about “controversial generals” last fall. During the panel discussion he mentions the percentage of his research that is now on the internet.